Scientists have known for years that the shape of the seafloor plays a role in how tsunami waves build up as they approach the coastline. Underwater topography also determines why some areas get hit worse than others. 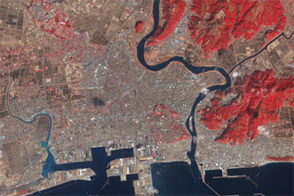 But in the wake of the Tohoku-oki tsunami, scientists now know that seafloor topography affects the strength and height of a tsunami even in the deep ocean and at great distances from the genesis of the wave. Scientists had suspected that underwater mountains and chasms, as well as islands, played a role in deflecting tsunami waves in some places and amplifying them up in others. But it was not until three satellites passed over such waves in March 2011 that they could confirm it. Researchers from NASA’ Jet Propulsion Laboratory (JPL) and the Ohio State University (OSU) used satellite altimeters to observe “merging tsunamis”—wave fronts that combine to form single waves at double the previous height. Such waves can travel hundreds to thousands of kilometers without losing power. The image above comes from a data-based computer model that shows how the waves can refract, bend, and merge as they propagate. Waves peaks are depicted in red-brown, while depressions in sea surface appear in blue-green. Grayscale outlines show the location of mid-ocean ridges, peaks, and islands. You can also view the animated model, which reveals the motion across the Pacific basin. 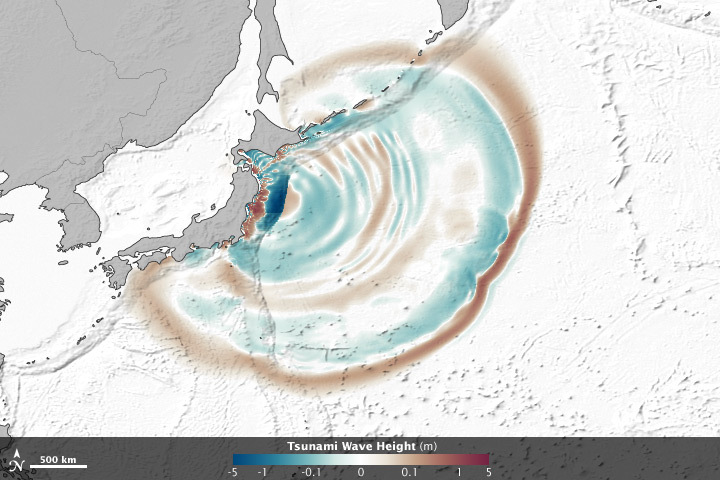 The team examined measurements of the wave fronts as gathered by the Jason-1, Jason-2, and Envisat satellites, each of which flew over the tsunami at a different location. Altimeters on each satellite measure sea level changes to an accuracy of a few centimeters. They found that the March 2011 tsunami doubled in intensity when passing over rugged ocean ridges and around islands in the middle of the Pacific Ocean. They verified their satellite observations by comparing with data from Global Positioning System (GPS) sensors and buoy data from the National Oceanic and Atmospheric Administration’s Deep-ocean Assessment and Reporting of Tsunamis (DART) program. 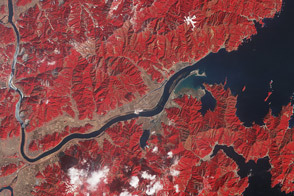 NASA Earth Observatory images and movies created Jesse Allen and Robert Simmon, using data provided by Tony Song (NASA/JPL). Caption by Michael Carlowicz. Even at great distances from their source, tsunami waves can grow by being focused and steered by underwater ridges. NASA Jet Propulsion Laboratory (2011, December 5) NASA Finds Japan Tsunami Waves Merged, Doubling Power. Accessed March 5, 2012. Song, Y.T., I. Fukumori, C. K. Shum, and Y. Yi (2012) Merging tsunamis of the 2011 Tohoku-Oki earthquake detected over the open ocean. Geophysical Research Letters, 39, L05606.